Any Make. Any Model. We’re all your car needs. Valid for $3 off emissions and $2 off safety inspection. Cannot be combined with other offers. Valid the 5th through the 25th of every month. Coupon void if altered. Expires 05/07/2019. Getting your car repaired is an inconvenience. Shopping prices, finding the right mechanic and the right shop is stressful. Virginia Tire & Auto does things differently. We make it as smooth and stress free as possible and offer you the convenience to get all your auto repair needs done under one roof with expert mechanics. Use our auto repair coupons for best deal on repairs and maintenance. Since 1976, the family-owned and operated Virginia Tire & Auto has tuned up cars, repaired brakes and performed countless oil changes for residents in the Northern VA area. Our shop offers competitive pricing and quality auto repairs done by ASE certified mechanics. We go beyond auto repair by making the wait at the auto shop a pleasant one. We have free coffee, tea, shuttle service and Wi-Fi. And on major repairs we provide a loaner vehicle. Use our oil change and VA emissions test coupons to save on your next service with us. Oil Change, Brake Repair, Belt and Hose Replacement, Computer Diagnostics, Check Engine Light Service, Engine Repair, Exhaust System, Driveline Service, Ignition Repair, Transmission Repair, Electrical System, Steering, Suspension. Tire Rotation, Wheel Alignment, Wheel Balance, New Tires. BFGoodrich, Bridgestone, Continental Tires, Cooper Tires, Dunlop, Falken, Firestone, Fusion, General Tire, Goodyear, Hankook, Kelly Tires, Kumho Tires, Michelin, Nitto, Pirelli, Toyo Tires, Uniroyal, Yokohama. Towing Service, Roadside Assistance, Virginia State Emissions Inspection, Pre Purchase Vehicle Inspection, Trailer Hitch Installation. Free Wi-Fi, Free Coffee & Tea, Loaner Vehicles, Car-Side Check In, Extended Hours, ASE Certified Technicians. 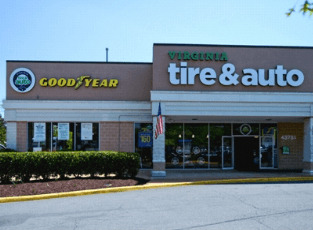 Virginia Tire & Auto has 13 locations in the northern Virginia area. Our auto repair shop is a short drive from the surrounding areas of Sterling, Potomac Falls, Brambleton and Lansdowne. See below for additional city locations. Ashburn - Four locations, South Riding, Sterling, Falls Church, Centreville, Chantilly, Gainesville, Springfield, Vienna, Fairfax, Manassas.